Sean Penn says his interview with drug kingpin Joaquin "El Chapo" Guzman was designed to start a "conversation about the policy of the war on drugs." "My article failed," Penn told CBS's Charlie Rose. "Let me be clear. My article has failed." When Penn's shocking 10,000-word article in Rolling Stone was published last weekend, most of the news coverage was about El Chapo's confessions, Penn's potential legal liabilities for meeting with the fugitive, and the process of how Penn landed the meeting in the first place. Penn was hoping for a different outcome. One of his points, he said, was that government's pursuit of individual drug lords and cartels arguably doesn't make a dent in overall drug use — a common view among activists. "We're going to put all our focus -- forget about blame -- we're going to put all our focus, all our energy, all our billions of dollars on the 'bad guy,' and what happens? You get another death the next day the same way," Penn told Rose. El Chapo asserted something similar in a response to one of Penn's questions. When asked whether he feels responsible for high levels of drug addiction, El Chapo said, "No, that is false, because the day I don't exist, it's not going to decrease in any way at all." El Chapo also said, "Drug trafficking does not depend on just one person. It depends on a lot of people." And: "If there was no consumption, there would be no sales." Penn, a world-famous actor, activist and occasional writer, has stayed quiet ever since his article came out last Saturday. In the meantime, questions have swirled about his motivations for meeting El Chapo and possible repercussions from it. He spoke with Rose on Thursday for an interview that will be shown on CBS's "60 Minutes." CBS released excerpts from the interview on Friday morning. "Let's go to the big picture of what we all want," Penn said. "We all want this drug problem to stop. We all want them -- the killings in Chicago to stop. We are the consumer. 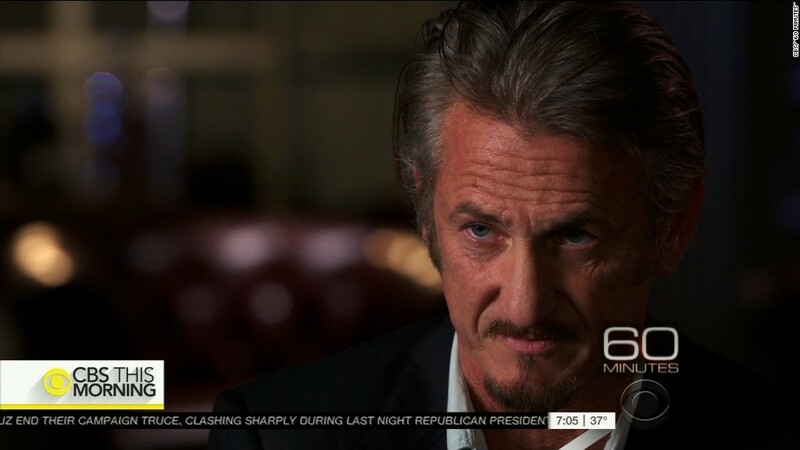 Whether you agree with Sean Penn or not, there is a complicity there. And if you are in the moral right, or on the far left, just as many of your children are doing these drugs." He added, "And how much time have they spent in the last week since this article came out, talking about that? One percent? I think that'd be generous." Penn also suggested that jealousy might partly explain the critical news coverage. "When you get the story that every journalist in the world wanted, there's a lot of green-eyed monsters who are going to come give you a kiss," he told Rose. He blasted critics who have dismissed him as "not a journalist." "I want to see the license that says that they're a journalist," Penn said. 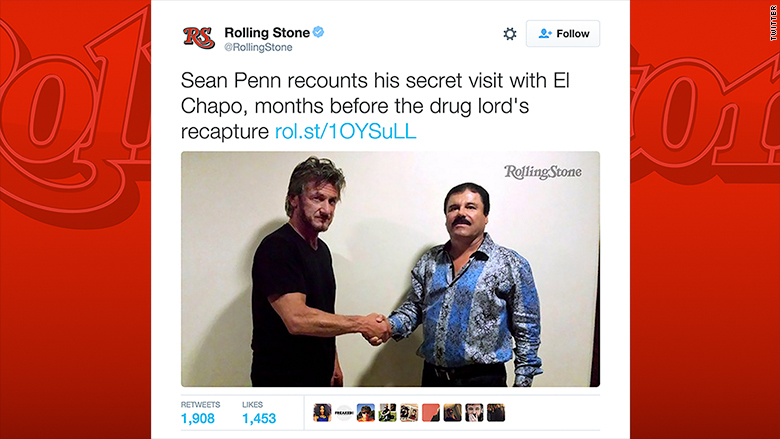 Penn also used the interview to rebut claims from Mexican officials that his meeting with El Chapo contributed to the drug lord's recapture. These claims have prompted speculation that El Chapo's Sinaloa cartel could target Penn. Penn called it a "myth" that his trip helped the authorities. El Chapo escaped from prison in July. Penn brokered a meeting with the drug lord through Mexican actress Kate Del Castillo. The visit occurred in early October, roughly two weeks before El Chapo reportedly narrowly escape a raid by Mexican marines. In an extraordinary coincidence, Penn's article was sent to the printing press on the same day of El Chapo's recapture. Penn commented to Rose that Mexican government officials were "clearly very humiliated by the notion that someone found him before they did... We're not smarter than DEA or the Mexican intelligence. We had a contact upon which we were able to facilitate an invitation." Rose asked, "Do you believe that the Mexican government released this" idea that the meeting assisted in El Chapo's recapture "in part because they want to see you blamed and to put you at risk?" "They wanted to encourage the cartel to put you in their crosshairs?" "Are you fearful for your life?"